Shepherd’s pie is a classic British winter dish. This vegan version has all the best qualities - it’s warming, hearty, comfort food at it’s finest. Made with chunky tender vegetables and chickpeas in a thick, rich gravy, and topped with fluffy potatoes which turn golden and crispy on the top. I’ve tried loads of vegan shepherd’s pie recipes in my time, and this version takes the best bits from each one to form the ultimate recipe. It’s packed with protein, is low-fat, and of course has a huge array of vitamins and minerals. But, most importantly, this vegan shepherd’s pie is guaranteed to put a smile on your face. Start by preparing your potatoes. Peel them and roughly chop into large chunks, then boil for 30-40 minutes or until they are tender. Drain and leave to cool. Meanwhile, soak the porcini mushrooms in 200ml hot water for 10-15 minutes, then lift out the mushrooms, reserve the liquid, and chop the soaked mushrooms into small chunks. Heat the rapeseed oil in a large pan, then add the onions, leeks, carrots and celery, and saute for 5-10 minutes until beginning to soften. Add the porcini mushrooms, garlic, tomato puree, soy sauce, paprika, squash, oregano and thyme, then continue to saute for another 5-10 minutes, stirring frequently. Now add the chickpeas (along with the liquid from the can), the lentils, the reserved water from the porcini mushrooms, and add a vegan stock cube or powder. Add the frozen peas and spinach, season with lots of black pepper (there’s enough salt already in the stock and soy sauce) and simmer for another 10 minutes. Take 200g of the boiled potatoes, mash roughly with a fork, and stir through the vegetables (this helps to thicken and enrich the sauce). 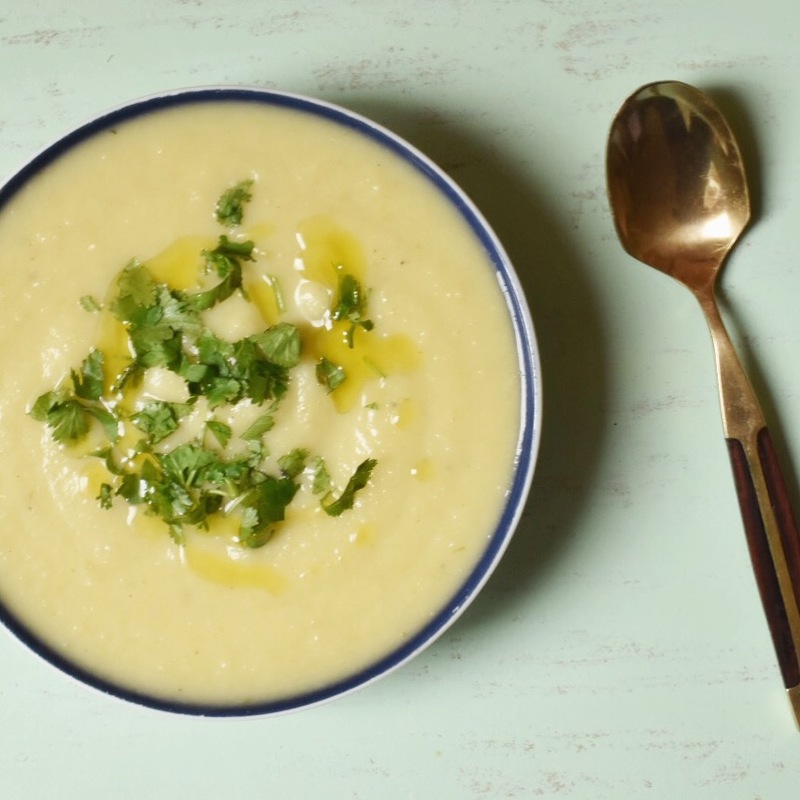 Now prepare the mash topping by mashing the remaining boiled potatoes with the olive oil, plant-based milk and fresh parsley until smooth. Divide the filling between your pie dish (or dishes). Dollop the mashed potato on top and spread out evenly over the pie using the back of a fork. When ready to cook, preheat the oven to 180C (360F) and bake the pies for around 40 minutes, until the filling is piping hot and the potatoes have turned golden and crispy on the top. Serve with a fresh salad or mixed green veg. Quesadillas are the perfect party food - you don’t need plates as they’re easy to grab with your hands, plus you can make them in advance and just warm them up in the oven when you’re ready to eat. Any leftovers make an awesome speedy dinner, served up with a simple salad. Don’t forget to make the quick guacamole to dip them into, as it really does complement these quesadillas really well. Veganising this classic Mexican dish turns it from a grease-laden snack into an incredibly healthy, nutrient-packed meal. Using the sweet potato and white bean mash as the filling instead of cheese, plus using whole wheat tortillas and serving with a fresh avocado dip, means they’re high in protein, packed with fibre and antioxidants, but with a fraction of the saturated fat. And they have ALL the flavour you want - the chipotle paste, maple syrup, paprika and nutritional yeast provide the perfect blend of smokiness, heat and sweetness. Firstly peel and grate the sweet potatoes. Heat the olive oil in a large pan over a medium-high heat, and add the grated sweet potato, maple syrup, paprika, turmeric, and nutritional yeast. Stir frequently and cook for 7-8 minutes until the sweet potato has softened, then season with salt and pepper to taste. Transfer to a mixing bowl and add the beans. Use a potato masher to smash the mixture together. It’s fine to leave some bits of un-mashed sweet potato but the mixture should now be ‘spoonable’. Now heat a frying pan and lay a tortilla flat in the pan. Spoon two heaped tablespoons of the mixture on to one half of it and spread out over half the tortilla, then fold the other half over and press down with a spatula. Dry fry on one side for about a minute or until it turns golden brown and beginning to char. Then flip over and repeat for the other side. Keep the quesadillas warm in the oven while you cook the remaining tortillas in the same way. When ready to serve, cut each of the tortillas into three slices. Quickly mash the avocados using the back of a spoon with the lime juice and coriander, and serve with the warm quesadillas. I’ve experimented with quite a few vegan tofu bacon recipes and so I wanted to share my favourite one with you. It’s such an easy recipe and quickly turns a humble block of tofu into a powerhouse of flavour that you can use in sandwiches, tear up in salads, or include as part of a healthy cooked breakfast. I deliberated whether or not to actually call this ‘bacon’, because I’m in no way pretending that it replicates the texture or flavour of bacon made from pigs. But it’s definitely tasty enough to take the place of traditional bacon in many dishes, including this vegan BLT, because it has a delicious bite, and salty, smoky, slightly sweet flavours that make this great protein source so versatile. Also, I couldn’t come up with a better alternative name - ‘smoky baked tofu slices’ just doesn’t have the best ring to it. Note: this recipe makes approx 12 slices of tofu bacon, enough for four BLTs - keep any leftover tofu bacon in the fridge for up to 3-4 days. Preheat your oven to 180C (360F). Quickly drain the tofu by pressing gently between your hands over the sink for about 30 seconds. Then thinly slice the tofu length-ways. Use a couple of pieces of kitchen roll to pat the tofu slices dry. Now mix up the remaining ingredients in a small bowl. Carefully dip the tofu slices in the marinade and arrange on a wire rack set over a baking tray. Bake the tofu bacon slices for about 15-20 minutes, until the edges start to turn brown and the tofu feels firm. Keep an eye on the tofu, especially for the last 5 minutes, because the marinade can burn if left in the oven too long. Remove the tofu bacon from the oven and allow to cool while you prepare your BLT sandwiches. Simply wash and slice the tomatoes and lettuce leaves, then add a few small dollops of the vegan mayonnaise. Then layer a few slices of the tofu bacon, and enjoy! I toyed with the idea of cooking a vegan quiche for a while, but for some reason didn’t get round to it until quite recently. I think I just presumed it would be a palaver to make. But I met with family for a Sunday lunch earlier this summer and thought I’d try making one to bring along. And I was genuinely surprised at just how easy making a tofu quiche was (with the help of my quick fool-proof crust, the same one used for my trusty vegan plum tart recipe). It really is delicious too, if I do say so myself! When baked, the creamy tofu provides the perfect quiche texture, and the garlic, leek and nutritional yeast all give lovely ‘cheesy’ and umami flavours. It went down a storm with my family, with vegans and meat-eaters alike all devouring it and asking for the recipe… So here it is! This quiche recipe is really versatile too. I’ve since made it with a variety of different vegetables - whatever I’ve had lying around - mushrooms, green peas, spinach, and roasted vegetables like courgette, aubergine, bell peppers and red onion, all work well. Best not to use veggies that contain too much water though (like fresh tomatoes) as this could result in a soggy quiche. Nutritionally, this tofu quiche contains just a fraction of the saturated fat of a traditional quiche, with just as much protein, more fibre, more iron, and all the flavour! Meanwhile, preheat the oven to 180C (360F) and prepare the filling. Unwrap the tofu and press it gently between your hands over the sink to squeeze out some of the liquid, then break up the tofu into a food processor. Blitz until smooth and creamy, adding a little splash of water or nut milk if necessary to help it reach a cream cheese texture (as per picture below). In a frying pan, heat 1 Tbsp of olive oil and gently fry the leek for a few minutes. Add the garlic, broccoli, basil, oregano, sun-dried tomatoes, nutritional yeast, and seasoning (to taste) and continue to stir for another few minutes. Now take the pan off the heat and stir in the processed tofu until thoroughly combined. Spoon the mixture into the base and spread out evenly using the back of a spoon. Bake the quiche for 30-40 minutes, until the quiche is firm to the touch, starting to go golden on the top, and the base is nice and crispy. Best served warm but store any leftovers in the fridge for up to 4 days as it’s also delicious served cold or reheated. This incredibly rich, full-flavoured vegan tagine starts life as a few humble ingredients. Other types of stews where similar ingredients are simply chucked in a pan are missing out on so much - it's the roasting of the vegetables, then the gentle simmering all together with the delicate spices in the oven that creates the richness of flavour and consistency that this tagine has in abundance (it's the same culinary chemistry principles that makes this roasted vegetable ratatouille so good). The addition of good quality Ras el Hanout is important to really make the dish stand out - it's a North African blend of spices available in most large supermarkets amongst the spices or world food sections, essential for any tagine recipe. This dish freezes really well so you can easily double-up on the ingredients and stock up some portions in your freezer for a healthy, vegan, warming pick-up on a rainy day! Recipe note - I'm not the biggest fan of dried fruit in savoury dishes, so I've replaced dried apricots with some date syrup - this provides even more richness and a subtle touch of sweetness, without having chunks of chewy dried fruit. It's just a personal preference but feel free to use 2-3 Tbsp chopped dried apricots instead if you prefer. To serve - cook 28g dried cous cous and 28g dried quinoa as per packet instructions then mix them together. Rub the cubed butternut squash with 1 Tbsp of the oil plus 2 tsp of the Ras el Hanout, scatter on to a baking tray and roast in the oven for 10 minutes. Add the cubed aubergine and sliced shallots to the roasting tray, mix everything around, and roast for a further 15 minutes, until the vegetables have browned a little and are tender. In your tagine (a casserole dish with a lid works fine), heat the other Tbsp of oil over a medium heat and fry the onion for 5 minutes, adding the garlic for the last 2 minutes. Add the remaining 3 tsp of Ras el Hanout and continue frying for a further 2 minutes to release the aromas of the spices. Stir in the harissa paste, then add the tomatoes, chickpeas, hot stock and seasoning. Stir in the roasted vegetables, the date syrup (or treacle), then cover with the lid and place in the oven for 20 minutes to simmer. Now remove the dish from the oven and add the Oumph! chunks, straight from the freezer. Stir, then cook in the oven for a further 5-10 minutes. 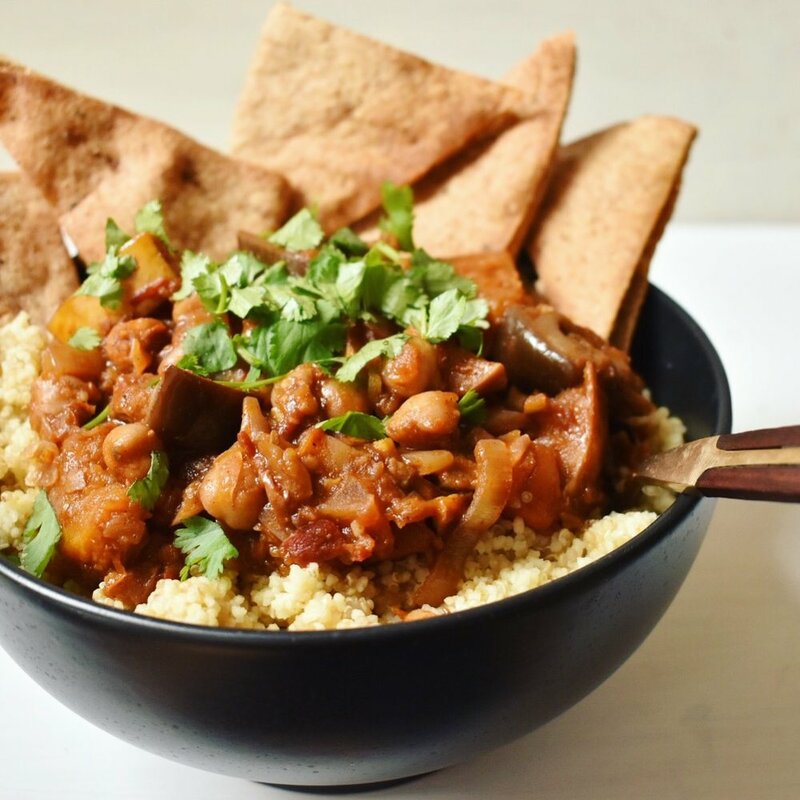 This vegan tagine goes brilliantly with a 50/50 mix of couscous and quinoa. Simply cook 28g dried couscous and 28g dried quinoa as per packet instructions then mix them together. I also made some quick roasted pitta chips (simply cut up some wholewheat pittas, rub with a little olive oil and dried mixed herbs, then roast for about 10 minutes until crunchy)! 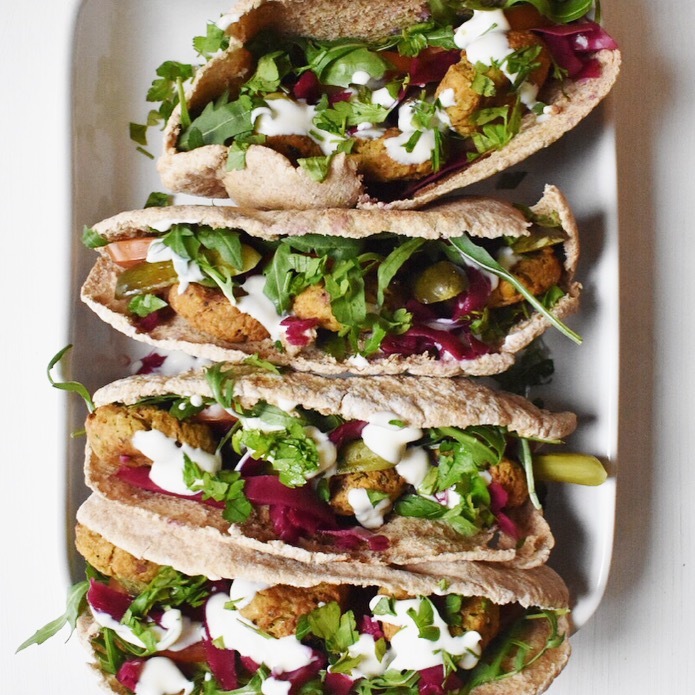 Falafels are a staple for many vegans. They're so handy - vegan, high-protein little bites that can be used in sandwiches, wraps, in salads, or just dunked in hummus. For ultimate ease you can buy them from any supermarket, and I often do, but these ones are nearly always deep-fried so can be high in fat. Making your own vegan falafels at home is so easy and if you oven bake them then they have just a fraction of the fat content, so these delicious, high-protein little bites are better for us (as well as tastier AND cheaper)! * I used dried breadcrumbs from a packet in this recipe. I'm all for making things as easy as possible so I keep some in the cupboard for recipes that call for them. Preheat your oven to 180C (350F) and line a baking tray with baking paper. Using a food processor, whizz up the onion and garlic until chopped finely. Next add all the other falafel ingredients, and mix for a little longer. You may need to scrape down the sides of the mixer a few times to make sure everything is thoroughly combined, but don't worry of there are still a few chunks of chickpeas as they can add nice texture to the falafels. Now shape the mixture into 16 slightly flattened balls, and lay on the lined baking tray. At this stage you can use just 1 tsp of olive oil on a pastry brush to coat the falafels - this will help to make them turn golden on the outside. Pop in the oven to bake for 30-40 minutes, turning the falafels halfway through so they brown evenly on both sides.